filtering the strange results of mantid cryptography. This entry was posted in Insects etc. and tagged Dictyoptera, entomology, flower, Garden, insect, invertebrate, mantid, Mantidae, mantis, nymph, Praying mantis, Tenodera aridifolia sinensis, wildlife. Wonderful work… so delicate and fresh looking! What magnificent light – both cool and somehow exotic, with that bright red and the model-like pose of the mantis. Wowww, wonderful capture!!!! Gorgeous colors, DoF and detail!!!! Fan dancer! Light, color is spectacular!! Like the amazing movies of the 40’s, this star is utterly amazing! Thanks Diane. A deadly dancer. 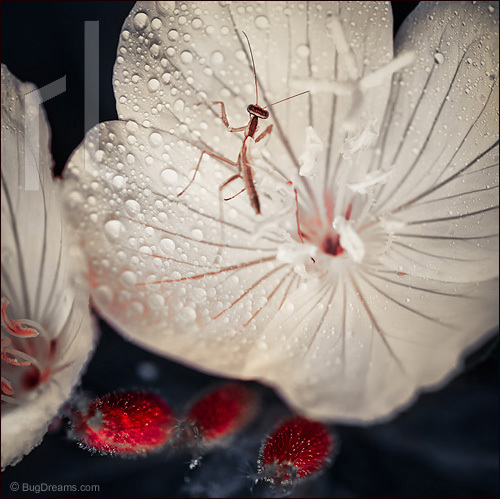 Fabulous capture, Is this a young praying mantis, it looks so brittle and transparent?! You are a master with words as well, wonderful!